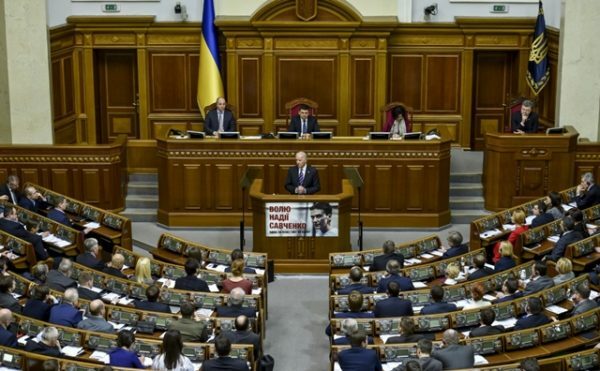 U.S. Vice President Joe Biden has assured Ukraine’s lawmakers that the United States will never recognize “Russia’s attempt to annex Crimea,” drawing a standing ovation in the country’s parliament. “Today, Russia is occupying sovereign Ukrainian territory. Let me be crystal clear: The United States does not, has not, never will recognize Russia’s attempt to annex Crimea,” he told members of the Ukrainian Rada on Tuesday, just before concluding a two-day visit to Ukraine. Speaking on conflict in eastern Ukraine, where Ukrainian troops have been locked in a battle with pro-Russia separatists for the past 20 months, he assured lawmakers of continued U.S. support, calling on Russia to comply with the Minsk cease-fire agreement designed to ease tensions over the conflict or face continued sanctions. “There can be no sanctions relief unless and until Moscow meets all, all of its commitments under Minsk,” Biden said. He also urged lawmakers to fight corruption, warning that the future of Ukraine is at stake. “Each of you has an obligation to answer the call of history and finally build a united, democratic Ukrainian nation that can stand the test of time,” Biden told lawmakers. The vice president also promised to tell the world the story of Nadiya Savchenko, a Ukrainian helicopter pilot being held in Russia. On Monday, Biden announced $190 million in new U.S. aid to Ukraine. “That means ramping up the pace of reforms, avoidance of past practices, advancing good governance, increasing transparency across the board at every level of the government and strengthening the rule of law,” he added. Poroshenko has overseen the dismissal of nearly 4,000 graft tainted prosecutors since taking office in May 2014. Last week, he also introduced a special anti-corruption prosecutor whose responsibilities will include rooting out graft and limiting the political power of shadowy business tycoons long seen as obstructing good government practices in the former Soviet republic. During their joint briefing Monday, Biden also said the U.S. “stands firmly with the people of Ukraine” in the face of “continued aggression” by Russia and Russia-backed separatists. He said the best way to end the conflict in eastern Ukraine is through the “diplomatic framework” laid out in an agreement signed in Minsk, Belarus by representatives of the Ukrainian and Russian governments, and the separatists. “Minsk cannot succeed if Russia does not fulfill its commitment and President Putin fails to live up to the promises he has repeatedly made to my president, to you and to the international community,” Biden said, adding that Russia is “systematically violating” the cease-fire agreed to in Minsk. Despite the cease-fire, sporadic fighting between government troops and pro-Russian rebels continues in eastern Ukraine, after more than 18 months of combat and nearly 8,000 deaths, most of them civilians.